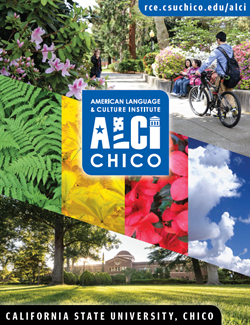 The mission of the American Language and Culture Institute (ALCI Chico) at California State University, Chico is to provide high quality language instruction, knowledgeable and supportive counseling, and a compassionate bridge between cultures. ALCI Chico invites you to study English and experience American culture in a safe, affordable, campus environment in northern California. We encourage you to explore the many educational opportunities both inside and outside the classroom at California State University, Chico. Find out why thousands of students around the globe have found Chico to be an excellent place to learn English and prepare for their academic success. Come to Chico State, meet new friends, enjoy beautiful California and learn English! Average class size is 13 students, 20 students maximum. Eligible students may attend regular CSU, Chico courses through Open University. The American Language and Culture Institute, Chico awards three types of certificates to recognize student achievement: attendance, completion, and proficiency. The type of certificate you receive depends on the grades you earn and your language proficiency level at the time you finish your studies. Your academic performance will be continually evaluated and grade reports will be issued at the end of each session. A TOEFL score is usually a requirement for college and university admission for non-English language speakers. TOEFL preparation classes are offered year-round through ALCI. The TOEFL iBT examination is administered on campus. To enhance English conversation and for cultural immersion, the Conversation Partner program pairs ALCI Chico students with local students and staff. Partners meet weekly to chat in informal situations. This gives ALCI students a chance to practice speaking English with native speakers and to learn more about the California culture. American students have the chance to learn new cultures and make international friendships. We also specialize in custom-designed programs for businesses, government agencies, athletes and international universities and institutes. Contact us for details.